As we reported about a week ago, ISPs seem poised to transition from an "unlimited" model to usage-based billing. Comcast claims it will not be one of them, although the company does impose a 250GB monthly cap. According to Comcast's Chief Financial Officer, Michael Angelakis, metered plans could possibly hamper the company's growth as a broadband provider. "Our goal is to grow and share average revenue per user" he said. "We don't want to disrupt the consumer experience". The company's executives seem to acknowledge that the gap between their television and broadband subscribers is quickly shrinking. Comcast lost 165,000 television subscribers last quarter but added over 261,000 broadband subscribers during the same time. Increasingly, those subscribers are opting in for higher-speed data packages and often times choose to bundle Internet with other services, like cable TV and phone services. Comcast sees this as an opportunity to upsell faster Internet. 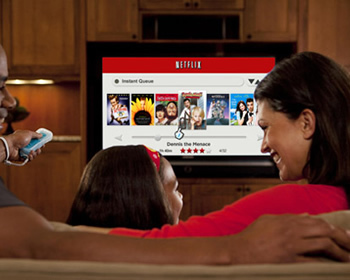 Reed Hastings, CEO of Netflix, thinks streaming video will outpace cable within 3-5 years. He told a group of analysts at the same conference in New York that streaming is, "all people are going to care about" in context to premium shows and movies found on the likes of HBO. "People are in love with broadband, in terms of click and watch". He continued to say that he considers HBO Go as his company's most fearsome competitor. Although Netflix and Comcast seem to be in agreement on the important role the Internet will play in future media, Comcast still institutes a 250GB data cap. In fact, the cap has not budged since it was first deployed in 2008. The company claims its median broadband subscriber uses about 6-8GB of data per month which is well within the cap. However, if Hastings is right, bandwidth caps and tiered pricing pose a risk to his vision of the future where streaming video will usurp cable television for premium content.